At Wente Vineyards, the tasting room visitors aren't the only ones drinking well. If you order a steak at The Restaurant at Wente Vineyards in Livermore, California, you’ll probably pair it with an estate red from the winery. It’s not just a classic pairing, it’s special because for the last six months of the steer’s life, it was drinking the same red wine. 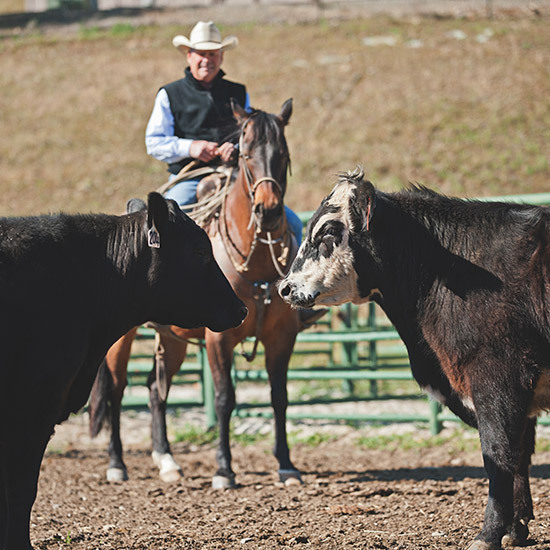 A cross between Black Angus and Shorthorn, the Wente cattle are treated much like Kobe cattle, which are fed beer to encourage fattier meat. But in place of beer, land-and-cattle manager Scott Beyer serves the animals wine. Specifically, the cattle get the winery’s estate red wines—most recently, the Double Decker Red Blend, a mix of Cabernet Sauvignon, Petite Sirah and Barbera. According to chef Matt Greco, who also helps manage Wente’s beef program, giving the cattle wine (about a bottle each per day) helps decrease the outer muscular fat and increase the marbling for tender, buttery meat. Right now, Wente beef is available only at The Restaurant in dishes like aged steaks, spicy coppa, corned beef and braised chuck ravioli. But the estate is hoping to expand its cattle program and sell whole animals in the future.